Parisian chocolate truffles. Need I say more? These treasures come from Paris’ La Cure Gourmande shop. With shops scattered through Europe, La Cure Gourmande confections can’t be purchased in the States, so you’ll have to pick them up in person or hope that you’re the lucky recipient of a gift. 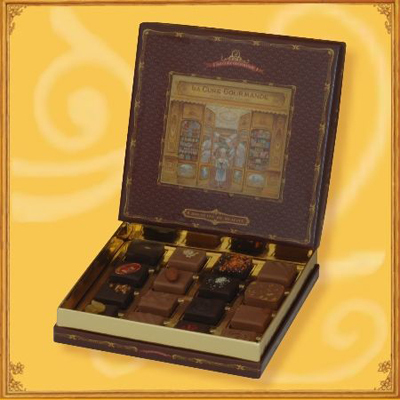 From the instant you see the old-fashioned truffle box you’ll get excited. As you pull off the decorative golden ribbon and lift the box lid, you’ll be greeted by the sweetest, delicate scent of French chocolate. And you’ll notice a little flavor booklet provided in the box so you can take delight in identifying the marriage of flavors you’re about to consume.